This is more like a pitiful news in light of the fact that Etisalat pioneer this development of the least expensive tarriff plan called Easy Life 4.0 preceding MTN take after suite with MTN TrueTalk Plus which gives you access to call all network in Nigeria for as low as 11kobo every second, 20kb to UK and environs. With this bundle, you'll really know the genuine estimation of your cash. The awful news is that MTN chose to stop this bundle by revealing a client disagreeable SMS that "Dear Customer, MTN TruTalk+ plan is no more accessible. 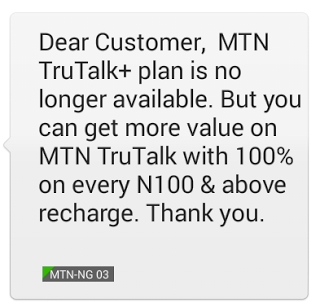 Be that as it may, you can get more esteem on MTN trueTalk with 100% on each N100 or more." I don't comprehend what provoked this stoppage however this is by no means client agreeable. Like are they for real??? Network in this country is messed up.